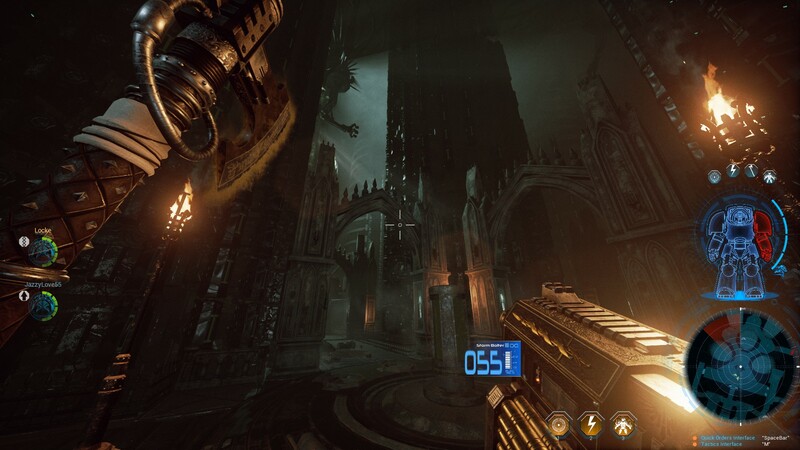 Space Hulk: Deathwing is the Warhammer 40k game I wanted 10 years ago. Its overall design - from the slow, plodding pace of the Terminators to the cramped corridors and distinct 40k architecture - and the emphasis on squad-based encounters against an overwhelming threat are truly outstanding. For every point where it shines, though, it also lacks a few modern gaming conveniences, making it difficult to recommend. If you’re unfamiliar with the lore of Warhammer 40k, here’s a quick primer on the key terms/ideas. Space Marines are genetically modified soldiers that defend humanity from everything in the universe that isn’t human, like the Tyranids. Several thousand years prior to the events of Deathwing, there was a significant schism within the Space Marine ranks and several of their number were corrupted by Chaos. Many of their ships were sucked into a place outside of known space called “the Immaterium” or “the Warp.” All of that floating wreckage occasionally accumulates within the Immaterium and becomes a “Space Hulk.” Space Hulks appear from, and re-enter, the Warp at random and often contain lost technology from the Space Marines’ past, thereby making them much sought prizes by a variety of races. With that out of the way, it’s worth noting that having prior knowledge of the vast lore of Warhammer 40k isn’t needed to “get into” Deathwing. The game itself does a fantastic job of drawing you into the world. The environmental and sound design work that Streum On has done is nothing short of impressive. Walking through the empty corridors and hearing the occasional scuttling of claws, a pipe releasing steam, or the metal of the ship creaking and groaning build a tense atmosphere where you never feel entirely at ease. While having a background in Warhammer studies may give you a little more insight into some of the things discussed in the story, there’s plenty to appreciate without it. In the single-player campaign, you play as a Librarian, the Space Marine version of wizards. 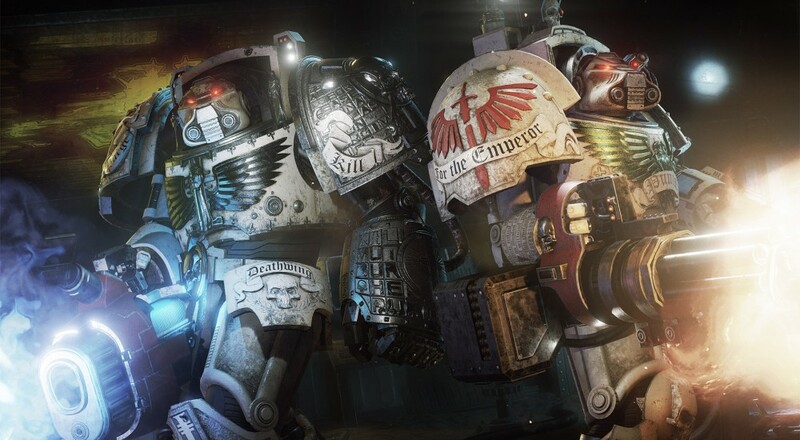 You are accompanied by two Terminators (Space Marine walking tanks) and sent aboard the Olethros to see what can be reclaimed. As you progress through the nine story chapters (learning the secrets lurking with the depths of the Olethros), you’ll unlock new gear that you can equip to yourself or your NPC squadmates and earn “Fervour Points” that you can spend on three different skill trees to unlock new abilities. The Fervour Points that are earned at the end of every mission are based on your overall performance, which is measured by how many enemies you kill, how many relics (in-game collectibles) you acquire, and how many times you warp back to base (the fewer, the better). The skill trees are split between Command (buffs for your squadmates), Devotion (buffs for you), and Psychic (new psyker abilities). This skill tree system is progression of a sort, but it’s very limited. There’s no rarity to the guns/weapons you get and the three skill trees don’t really do much to offer variety in the gameplay. While some of the equipment and skills provide an illusion that you could “spec” yourself into a psyker that utilizes heavy weapons or even melee weapons, the limited intelligence of your A.I. squadmates means that you’ll artificially increase the difficulty by not gearing everyone a certain way. This is different from the actual difficulty level you can set prior to playing, as that only appears to increase enemy health, making them tougher to kill, and increases the damage you take. As an example of that limited A.I. intelligence, for one mission I decided to use an assault cannon for my ranged weapon (which has a brief spin-up time before it fires and can jam for a few seconds) and geared the Assault NPC squadmate to be more melee focused. I thought he might go in front to act as a shield while I fired at things from behind, even though there’s no command to specify a formation. So, instead, he followed behind me and was perfectly happy to let me just take the hits. Whenever there were ranged enemies, he was completely useless and the Apothecary NPC seemed to busy trying to aim at the Genestealer I was already shooting at instead of the enemies shooting at us. Page created in 0.2815 seconds.